Yesterday Drake successfully reignited the collaboration rumors surrounding himself and Kanye West. During the summer, both artists promised a joint project, however since then, the only thing that has been released is a billboard (see above). 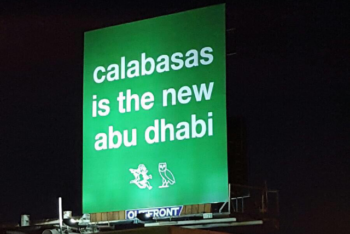 The billboard in question only had one line of text which reads “Calabasas is the new Abu Dhabi”. This is interesting as it seems Drake has further referenced the billboard, as the picture uploaded is one of Drake and Ye with the caption “There goes the neighborhood”. It wasn’t until Scooter Braun, manager of Kanye and Justin Bieber, commented on Drakes pic with “it begins…”, that gave this update a serious amount of legitimacy. Braun has never been one for personal publicity stunts, which begs the question; why would he comment what he did if something wasn’t about to begin. Could we be days, perhaps hours from a surprise release? Black America Again’was released on November 4, 2016. Black America Again is Common’s eleventh studio album. The album is a politically charged album that focuses on the current issues that’s taking place in the United States. Common has always been for the people and about the people since the beginning of his career. Common is very active in the African American community, he has used his voice to speak to the people and influence the youth in a positive way. The Chicago native has worked closely with President Obama who is also from Chicago on a number of programs designed to keep young African American men out of trouble and steer them in a positive direction. The release of the album couldn’t have been at a better time. The album speaks for the people without a voice, cries out for the oppress. Black America Again is for justice, a new light, a chance to start over and a better America for all. This weekend Atlanta rapper T.I. goes off on Lil’ Wayne over his interview on nightlife. In the interview Lil Wayne stated that he did not have any involvement in the “Black Lives Matters” movement. Wayne said that he doesn’t care about what doesn’t involve him. This pissed off T.I. which led to a rant later on Instagram. He told Lil Wayne that he is a disgrace to his family and that he needs to stop whatever BS he’s on and to open his eyes and see what’s going on around him. Later that night Wayne tweets “Fk ya”. Directed to whom? We don’t know. Many say that was a fire at Tip. Was T.I.’s Instagram post too much? If he is claiming that they are like brothers and that their families are family then why would he go out and throw Wayne under the bus? He could have simply called him and shared his knowledge but he decided to get angry over social media.